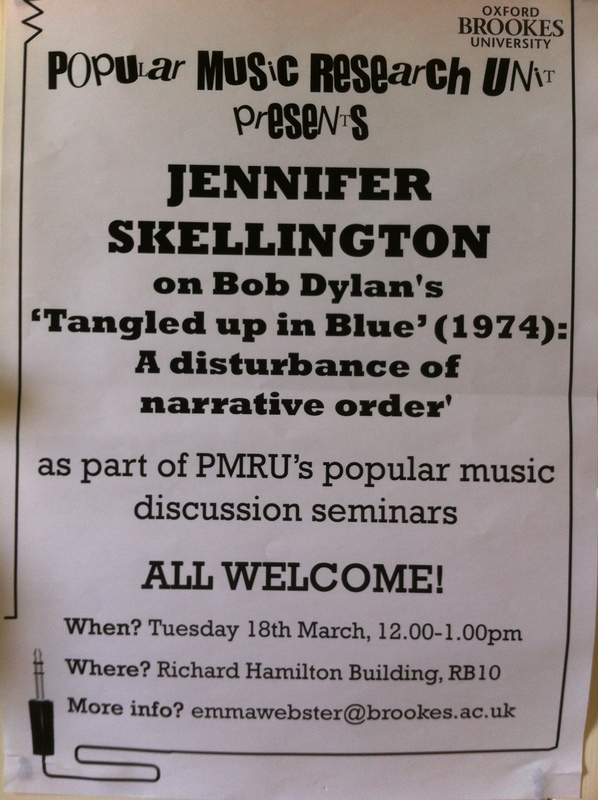 Dr Jennifer Skellington on Bob Dylan’s Tangled up in Blue (1974): A Disturbance of Narrative Order? 1pm, Tuesday 18th March, Oxford Brookes University, Richard Hamilton Building. This is the first session in this year’s exciting series of open lectures to be provided by members of the Oxford Brookes Popular Music Research Unit. In this lecture Jennifer will not only draw attention to the many subtleties in Dylan’s lyrics and vocal emphasis but will question whether or not the track can be heard as biographical. Jennifer will then consider Michael Gray’s claim that a “disturbance of narrative order…is the particularly modernist feature of Tangled up in Blue” (Gray, Song and Dance Man III, 1999).